Yesterday I took TG to the thrift store. She was thrilled to find a nice big bag of fabric scraps for herself. She uses them to make her dolls and other things. I was thrilled to find some wonderful craft books and magazines in the era I most like. The 70s! As I was leafing through the 1971-1972 Fall Goodhousekeeping Needlecraft magazine, my family had a conversation about classic vs not classic. How can you tell the difference? Vintage magazines are a great way. Is something still wearable today? Sometimes you have to look past the colors, and the accessories or look at things as separates to know if the lines and style are still wearable today. Other times you know instantly either way. Click on images to see larger, all images from the magazine I mentioned above. This coat has wonderful lines for the under 25 set. My daughter is charmed by it. 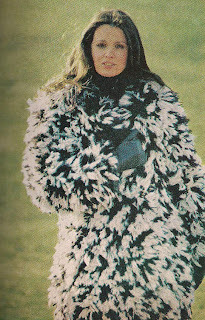 Not in those colors, I think if she decides to make it, she'll make it in Tom Baker scarf type colors. The soft hood and simple shape would also look good in a solid color. This one, I have mixed feelings about. I love the sweep, and the lines remind me a lot of the capes my mother wore to great effect. Unfortunately, at 5'3.5" I'm too short for anything that dramatic, it would look like I left the house wearing a blanket. Check out those gloves! Aren't they great? 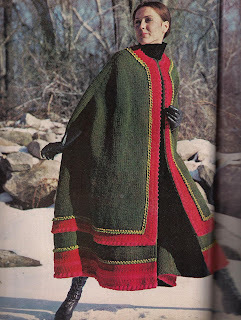 The bobble edging on the cape adds a lovely amount of visual and textural interest. The colors, well. Not so much, maybe a medium grey with pewter grey and crimson? Not classic. I love various elements of this, the button detailing, the hood, the striping, but it's really, really not classically wearable. Ponchos come in and out, but that one does look very much like a blanket. 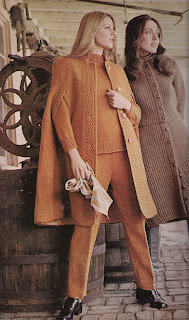 Oh the horror of knitted pants! I'm pretty sure that's always going to be a very bad idea. And the color is a mucky orange. The other outfit is a skirt and cardigan set. Taken by individual elements, I don't like the skirt or pants. The cardigan and pull over sweaters are nice. 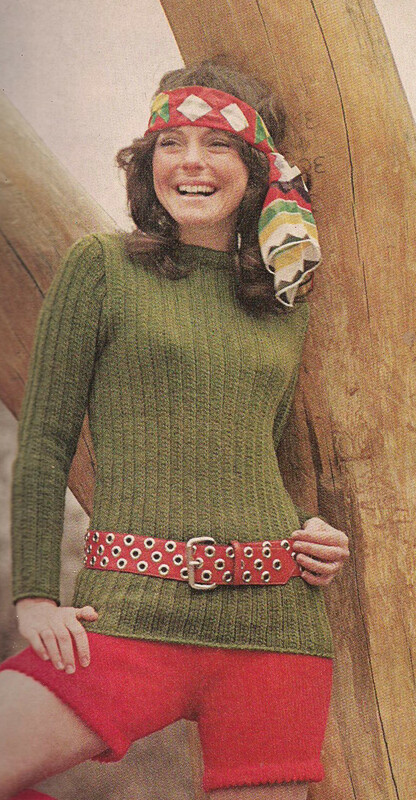 I'd lengthen the sleeves on the pullover and probably get rid of the bottom hem cables on the pullover for a straight bottom. The cable border detail with it's honeycomb effect is very pretty though. The cape doesn't work for me either. I like capes but that one isn't fitted right around the shoulders and is very boxy looking. Oh lovely. Again, if you aren't a bright color sort, picture it with less going on for color. This dress has lovely classic lines and would look great with tights in black with jewel tone stripe detailing, or just a solid color. Not classic. 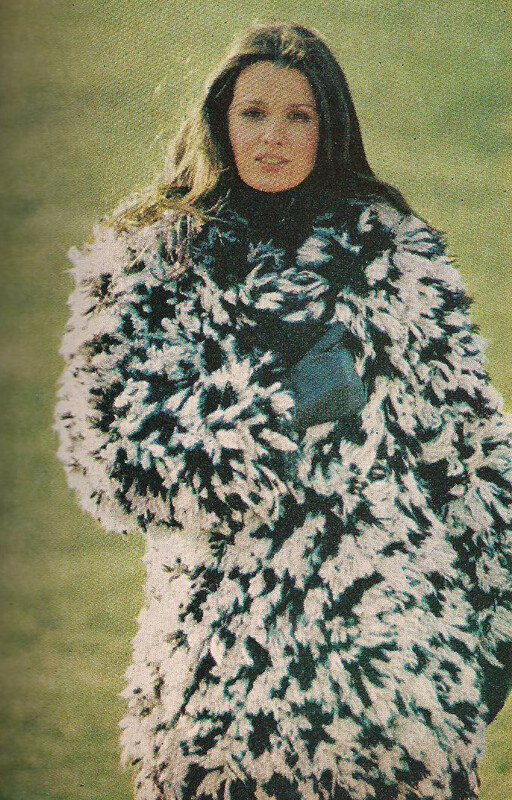 This coat is made by creating yarn loops as you knit, then after you're done, combing or brushing the loops to break up the twist and create a fur effect. It's a fun idea for a stuffed animal, doesn't work as well in a coat. Classic- Sweater. Not Classic- those shorts! The sweater is nice, the crocheted sash is fun, and I could totally see my daughter wearing something like that. The "funnel hood" is knit in Quaker rib and it's not really a classic design that's been wearable for the last 40 years since the magazine came out, but it *is* an idea that's come back around as a trend. 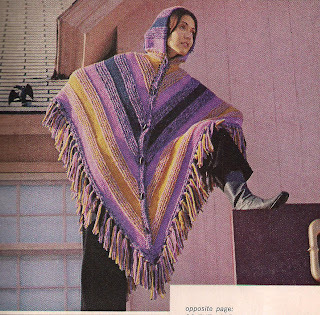 The knitted gauchos though? Really didn't age well. 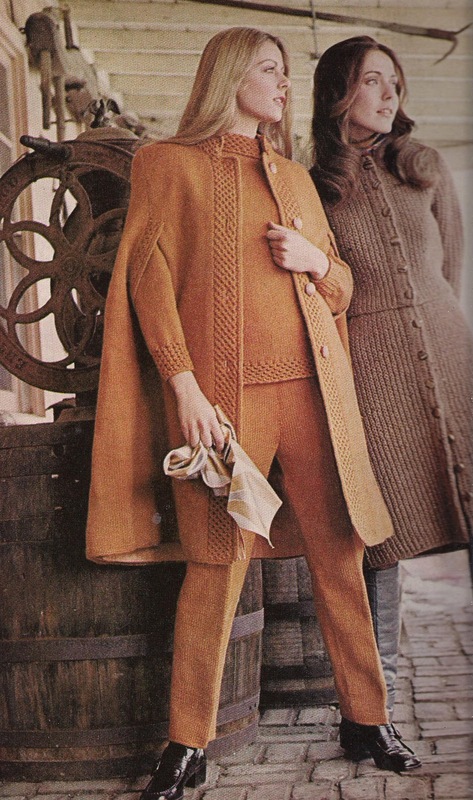 I think maybe just any kind of pant thing knitted might be a bad idea. Just.. wow. The colors, the lines, everything about this outfit. It doesn't age well at all does it? The great big checks with smaller checks in some of the big checks is a neat pattern. Maybe better for decorating than for clothing. LOVE this simple teeshirt dress with it's bold graphic design. 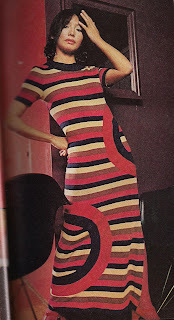 I think I'd like to make a custom fabric print on Spoonflower to make something like this dress with. 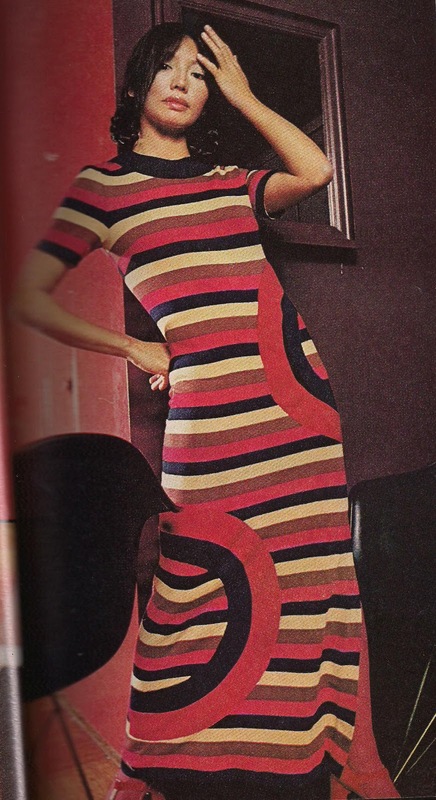 In the case of this dress, it's sewn with striped fabric and applique circles. Doing a custom fabric removes the need for applique for that same kind of bold style. This is a fun post. 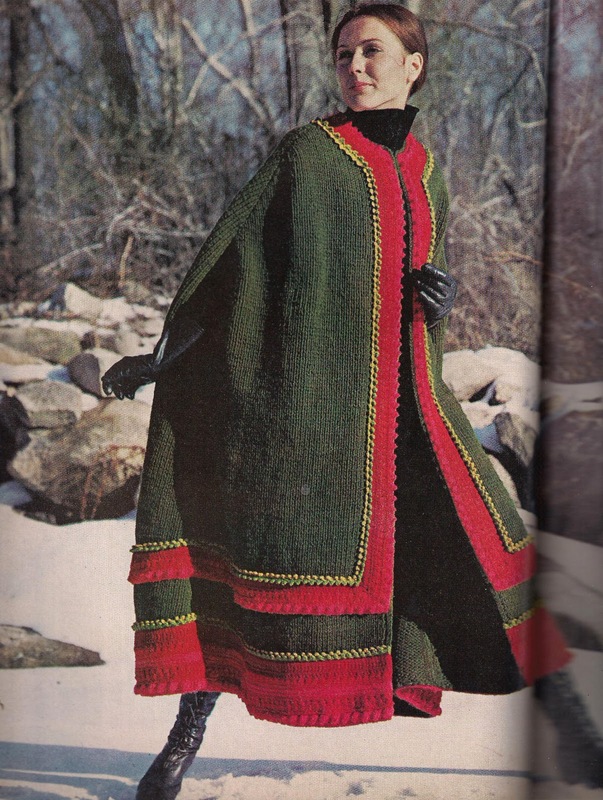 I love looking through my old patterns and I actually use many old patterns with newer colors, a bit of change in the design--adding different stitches, adding fairisle type design, taking away patterning, etc.-- to get something that is mine. For those who like these classic looks, find a pattern that works for you and use it as the basic pattern. Add or subtract from the pattern to fit the design you want to the pattern you are using. This method requires that you follow two patterns, one for shaping and 1 for the knitted or crocheted design, but you can be fairly sure you will like the result because it fits you. Is that a very young Susan Dey modeling the awful knickers and vest?